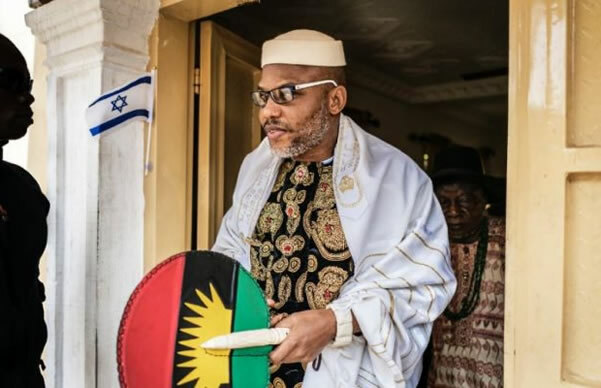 The Indigenous People of Biafra on Sunday said its leader, Nnamdi Kanu would expose more about the nationality of the presidential candidate of the Peoples Democratic Party, Atiku Abubakar. It also insisted that the person occupying the seat of Nigeria’s president was not the “real” President Muhammadu Buhari. The All Progressives Congress had told the Presidential Elections Tribunal last week that Atiku was a citizen of Cameroon and therefore was not qualified to contest any election in Nigeria. IPOB, in a statement made available to our correspondent in Awka, Anambra State by its Media and Publicity Secretary, Emma Powerful, said its leader would soon exposé more on the two issues in a broadcast. The group’s statement read in part, “Every lecture on history, social policy, economy, politics and law is designed to liberate the poorly informed half-educated masses of Nigeria from the darkness and oppression of Fulani Caliphate misrule, illiteracy, broken education system, mediocrity and subjugation. Those who, over the years, derived joy in propagating the lies that Radio Biafra is about propaganda and hate speech are the ones today relying on it to get factual information on constitutional law in Nigeria. The group added, “Those that referred to IPOB as miscreants are now the same people quoting and referencing the speeches of our supreme leader, Mazi Nnamdi Kanu, in their legal depositions. Nigerians will come to the inescapable realisation that Maj. Gen. Muhammadu Buhari is dead and the impostor in Aso Rock is neither of Nigerian citizenship as Atiku nor birth, which both Jubril and Atiku are not.